Yes, late in the game, I know. I’ve seen these cards advertised on Flickr for the longest but have never actually seen one in person. I was at a great gathering tonight and got a few of these calling cards from some great people I met and was very impressed by the quality of printing and paper stock. Nice hefty stock with a yum satin finish. 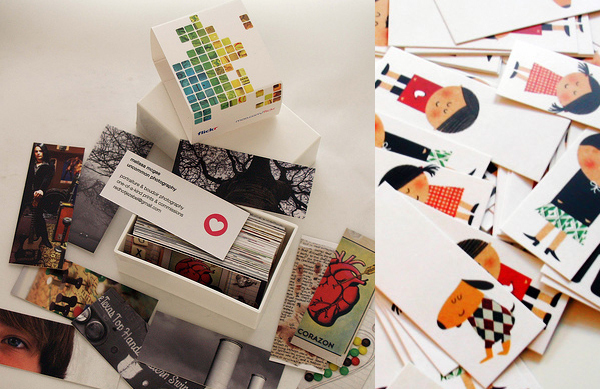 These cards are done by a company called Moo and work seamlessly with your Flickr account. Order in batches of 100 and recieve cards with images from your own Flickr stream, cropped however you like to fit these skinny-mini calling cards. (You can order 100 cards each with a different image on them… or 100 cards with just one image. Sweet!) The other side can be personalized with up to six lines of text. See what others have done with their Moo cards. I already ordered a set. This could get addicting. Moo cards found on Flickr: RedHotJezebel's cards. Blancucha's fabulous illustrated cards. Moo calling cards, $19.99 for 100 cards. I’ve convinced a few people to get the moo cards. They’re such a great deal for such great quality. I’ve been wanting to make moo cards for a while now! Gah! I love them so much! Maybe soon! just how much do these little prettie run anyway?